A Naik in the 51st Sikhs (Frontier Force) who was born in the village of Kang Sahbu in the district of Jalandhar, East Punjab. He was killed in action while fighting in the Mesopotamian Campaign, leaving behind a widow and son. 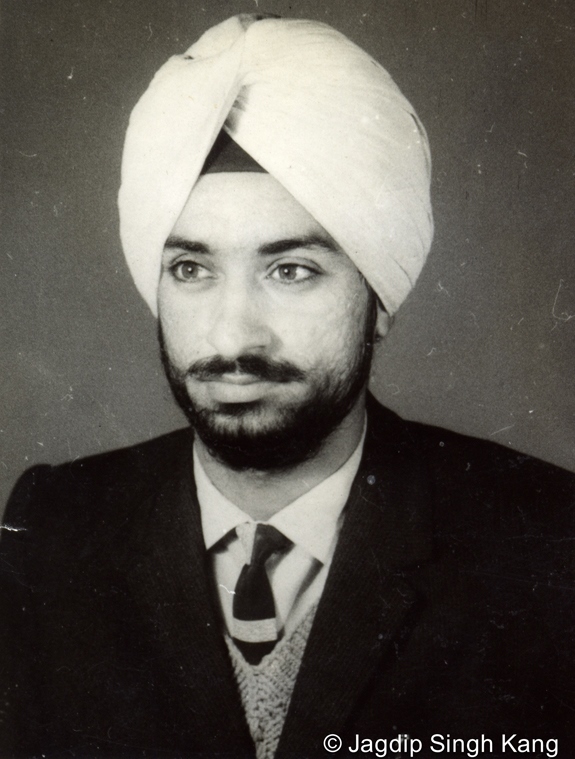 His life has been researched by his great-grandson, Citizen Historian Jagdip Singh Kang. Thakar Singh was born into the family of Sundar Singh in the village of Kang Sahbu. It is situated in the tehsil of Nakodar in the district of Jalandhar, East Punjab. As there was no school in the village he did not recieve a formal education. He married Basant Kaur (see image of her) and the couple had a son, Chanan Singh. Basant Kaur brought up her son under the guidance of her father-in-law, Sundar Singh. Thakar Singh joined the 51st Sikhs (Frontier Force) regiment as a Sepoy, while a brother, Battan Singh, joined the 26th Punjabis (also as a Sepoy). Another brother, Mayia, died in his youth. At some point, Thakar Singh was promoted from a Sepoy to Naik. He was killed on 1 August 1916 in Mesopotamia but it is not known exactly how. A fairly lively reciprocal bombardment took place this morning lasting about ¾ hour. Our HE (High explosive)? again did some damage to enemy’s front line parapet. Enemy’s fire though hitting our front line parapet in places and being distributed also over 2nd and 3rd lines was ineffective. One day is very similar to another in the trenches and nothing abnormal occurred to 31st July. Our casualties were slight e.g. 1 killed, 8 wounded. At 5.30pm a placard in Turkish, was erected by order, on our front parapet announcing to the enemy the fall of Erzinjan. The arrival of our new aeroplanes has been followed by increased aerial activity on our part. Given the above, the most likely cause of Thakar Singh's death is sniping or artillery fire. After Thakar Singh’s death, Basant Kaur used to commemorate his death anniversary by providing dinner to five Sikhs in the month of Assu (September/October). This was always a big day in the family. Thakar Singh’s son, Chanan Singh, was granted twenty five acres (muraba) of land in Montgomery District in West Punjab. 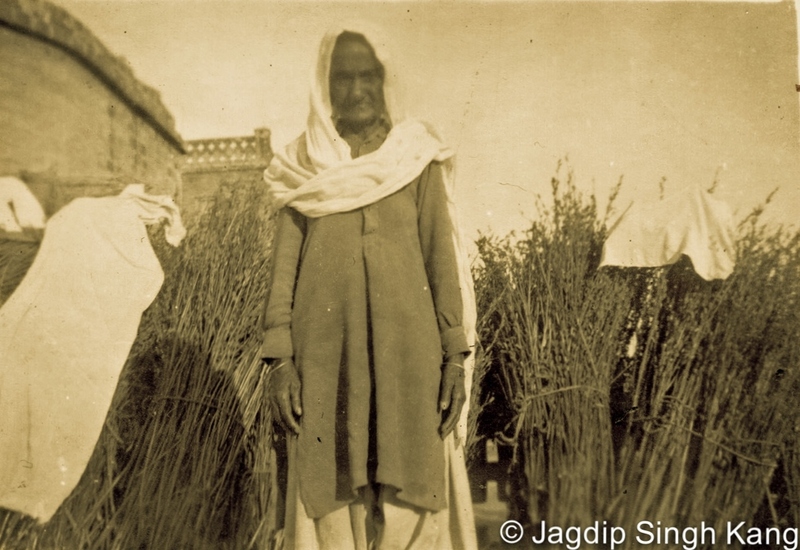 Around 1924-25, Basant Kaur and her son, Chanan Singh, moved there with their extended family. After Partition in 1947, the whole family returned to the village of Kang Sahbu. They lived in the house that Thakar Singh had built (see image). Basant Kaur was awarded a pension of 11 rupees per month, which was considered to be good at that time. After she began to receive the pension, Basant Kaur came to be known by the name of ‘Milkhan’. She died in 1973. My grandmother’s name was Basant Kaur but she was popularly known by the name of ‘Milkhan’. Every month she would go to Jalandhar to withdraw her pension. We kids eagerly awaited her return, because she would always bring some sweets. She usually felt sad on that day. She often used to say about that ‘Baba [grandfather] went to Basra but didn’t come back’. A long time ago, I was reminded of this after reading one particular line in the Guru Granth Sahib. It said (page 418): 'Their husbands did not return home – how did they pass their night?' I remembered my grandmother and felt so sad that I could not sleep that night. We use to call her 'Ma Ji'. She was a very brave, hard working and skilful lady. She would work all the time, doing household tasks, and feeding and milking the animals. Her hobbies were working the spinning wheel (charkha) and needlework. She was very skilful in weaving the mats (darris) and beds (charpaees). She regularly prayed using prayer beads (mala), in the early morning and at night time. In the mid-1970’s, I went to visit India and searched grandmother’s old wardrobe (sanduk), which was still in our house. I found one small quilt (gudalee) containing medals, buttons and a silver rupee. I told my mother that I want to have these. She willingly handed them to me and said to use the silver rupee coin as a gift at the engagement ceremony of my daughter, which I did in 1992. I handed the pair of medals over to my son [Jagdip] to find more information. Thakar Singh's family name is Kang. 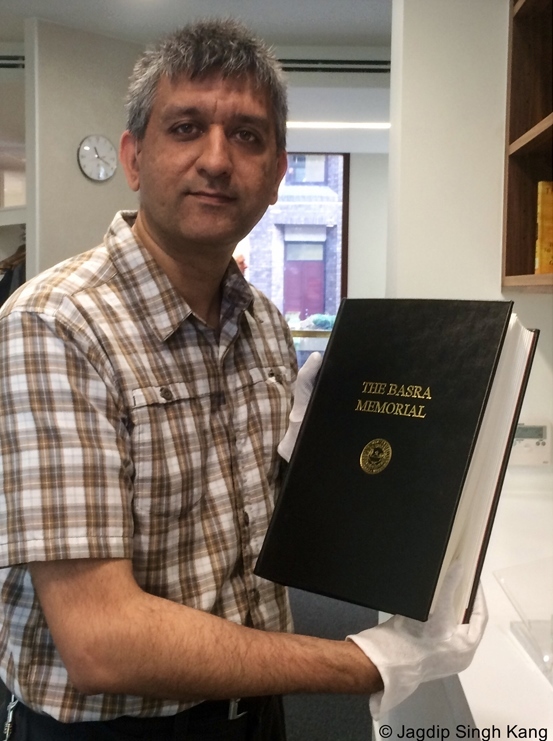 Thakar Singh is memorialsed as one of 275 'Other Indian Soldiers' of the 51st Sikhs (Frontier Force) on Panel 67 on the Basra memorial in modern-day Iraq (see image). Thakar Singh’s son had three sons: Lashkar Singh, Sadhu Singh (see image) and Harbhajan Singh. Lashkar Singh worked on the farm (from land inherited from Thakar Singh), passing away in 2000. Sadhu Singh and Harbhajan Singh both moved to the west and settled in England and Canada. Thakar Singh's great grand-children are today settled in Australia, Canada, England and Singapore.